Now at Sky Zone Macgregor! Be stealthy, be swift and weave your way around like the warrior you are. Ever wanted to let your inner Ninja loose? Come down and test our your skills at our Enduro Warrior Course! Aspiring Warriors over 110cm tall can climb, weave and swing their way around the course. Included in the general jump price at all Sky Zone venues, guests of all ages are invited to put their agility to the test. With an Enduro Warrior course, wall-to-wall trampolines, huge climbing walls, a flip and fall foam pit and more, Sky Zone is the ultimate day out for families. Gather your friends and family and get into the swing of things. 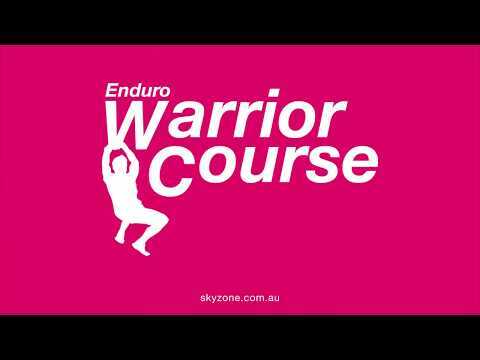 What is the Enduro Warrior Course? Whether you’re learning the ropes or king of the swing, our sky-high Enduro warrior course will put anyone up to a challenge. Bounce across the staggered steps, test your balance along the beam, fly on the trapeze and zip lines and climb across the monkey bars. How old do you have to be to do Enduro? To participate in our Enduro Warrior Course, you must be 5 years old or above and over 110cm. Are adults allowed on Enduro? Enduro is for both adults and children over 110cm. Can you book for just Enduro without a booking for jumping or climbing? Enduro is included in our Jump price, you can’t book it separately. However, you can spend as much or as little time on Enduro as you want. As an adult, will I find Enduro difficult? Whether you are a fitness fanatic or just wanting to try something new, Enduro will test the skills of everyone alike but it’s always bound to be a good time! How long are you able to go on the course for? Spend as much time as you like on Enduro within your Jumping session. Enduro Warrior Course is included in our standard jump price. To book, click on the 1 hour or 2 hour jumping option. Book your session now. How much is it to access Enduro? Enduro is included in the jump price. Check out pricing at your local venue here. Is Enduro included in the weekly Sky Zone Promotions? Definitely! All daily jumping promotions include Enduro Warrior Course access. Is there anything else I should know before I experience Sky Zone’s Enduro Warrior Course? If you have not used the Enduro course before, please talk to our friendly Sky Guards who will brief you on how to have the best time ever whilst being safe! Remember to know your limits and take breaks when you are tired. Whilst on the Enduro Course, do not attempt flips or advanced aerial maneuvers, or hang upside down. Before beginning your Enduro experience, empty your pockets and secure loose items (including tying your hair back). Enduro is an obstacle course built as a challenge for you! It includes balance beams, monkey bars, zip lines, trapeze activities and more! Awesome for beginners to fitness fanatics with a chance for everyone to take part from children to adults. We even have a cool timing system so you can race your friends. Do you have to wear shoes? On the obstacle course you must wear Sky Zone grip socks. They cost $3 and are available for purchase online or in venue. Shoes are not necessary. How many people can go on Enduro at one time? 9 people can be on Enduro at a time. One on each element within the course. When is it Enduro open? Enduro is usually open during Sky Zone’s opening hours. However, if you are in the venue when Enduro is not open, please see our friendly reception staff, who will gladly organise it to be opened for you. Can I book out Enduro to myself? Unfortunately, unless a organising a venue lock out you cannot hire Enduro privately. To enquire get in touch with our function team here.